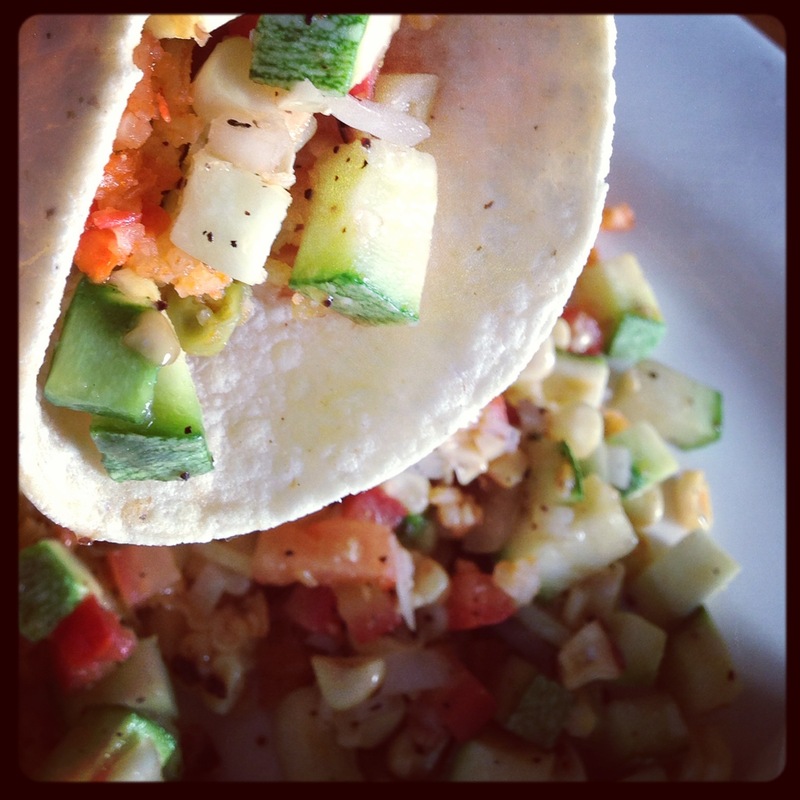 Mercado has to be one of the most fun dining experiences we’ve had in Santa Monica. We were welcomed warmly by co-owner Jesse Gomez (who also owns Yxta Cocina Mexicana) and assured that we were going to enjoy ourselves. Looking around the intimate space, filled with more people that one would expect on a weekday evening, we knew we were in for a great night of eating. Reading up on our hosts, it strikes me immediately that co-owner and Executive Chef Jose Acevedo is from Guanajuato, Mexico, because that is where Friand’s family lives and where we just visited in March. How cool is that? And it would also explain why Friand thought the ronpope with his flan tasted very similar to his mother’s. It’s no secret that we are going to start with cocktails. You’d think, reading this blog, that we are lushes, but really no. We just enjoy well made drinks and have come to realize that the smaller the cocktail menu, the better quality of drinks. Both of us ordered the Margarita de Jamaica (hibiscus-infused reposado tequila, triple sec, fresh hibiscus, fresh sour), although Friand was intrigued by the drink specials. Again, the designated driver, I was happy to give him the opportunity to try one of the specials later in the meal. My margarita was delicious! Happily, it was just sweet enough to keep me from drinking too quickly but perfectly sweet for what it was. I loved it! Before our drinks arrived, Victor gave me the rundown on the vegan options. 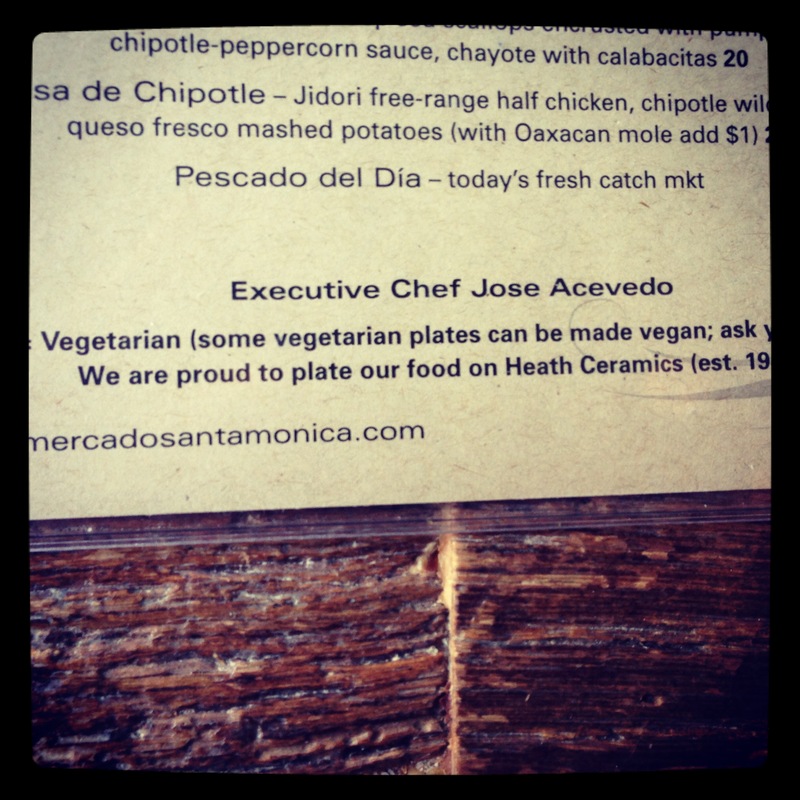 He pointed out something particularly important which is that most of the vegetarian items, all designated by (V) in the menu, can be made vegan; he recommended the Santa Monica Farmers’ Market Enchiladas because the only thing that would take the dish from vegetarian to vegan was to leave off the cheese sprinkled on top. He really talked it up well, he’s a great salesman, and so I hoped the dish would live up to all the hype. 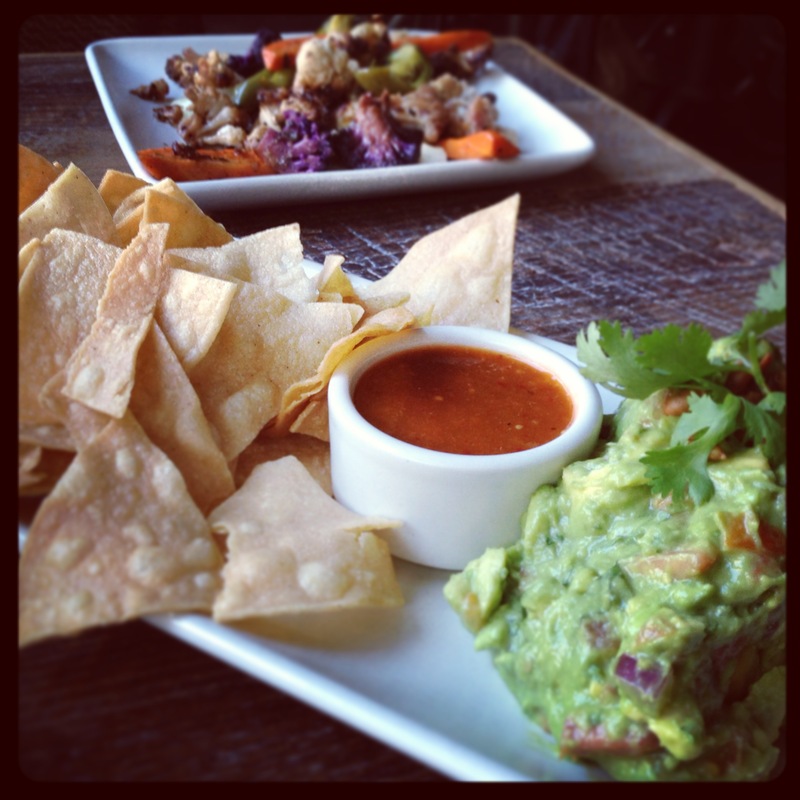 Our appetizers, guacamole and coliflor, arrived quickly and we were anxious to dig in. The guacamole looks exactly the same as its doppelganger at Yxta, but once we dug in, it became clear that this guacamole was special. Again, the perfect balance of veggies floating around in there, rough chopped cilantro and spicy pepitas dancing on top, and the best part of all: big chunks of avocado to give you something to bite in to. 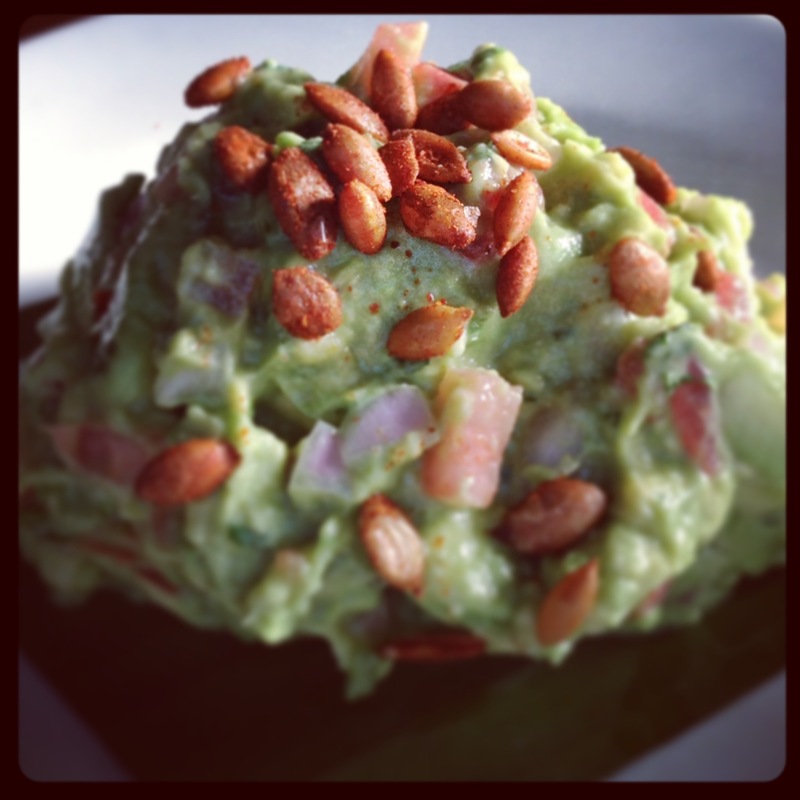 The salt and lime were so well balanced in this guacamole that there was really nothing to complain about. In fact, the spicy sauce that accompanies the guac wasn’t even necessary! Although… I did discover that adding the bigger chunks of avocado to bites of the cauliflower was an unexpected and exciting combination. Speaking of the Coliflor… Look at how beautiful those colors are! 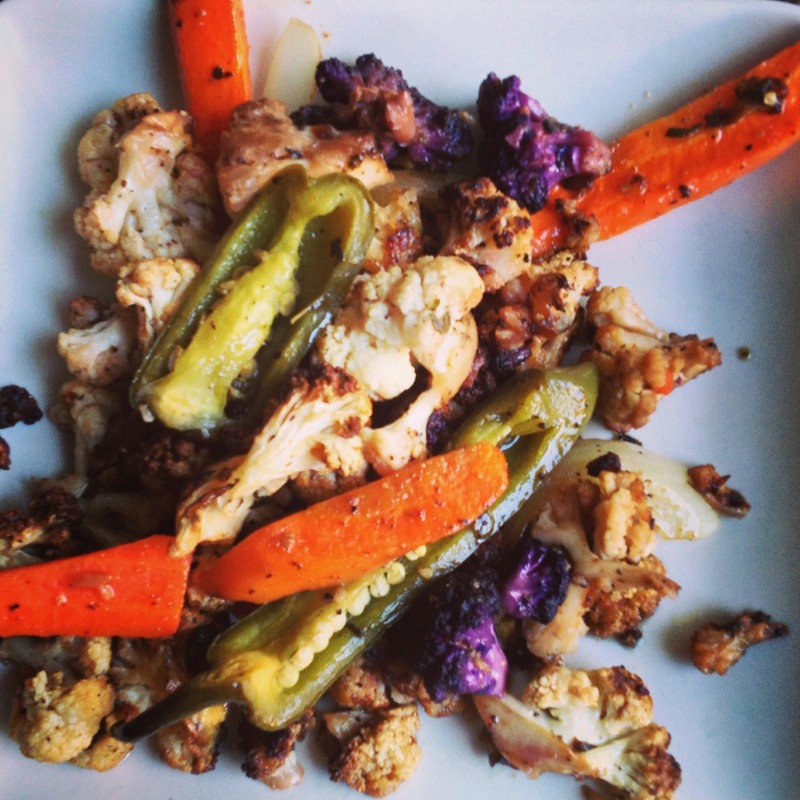 White and purple cauliflower, carrots, onions, and jalapeños, all came together in a dark smokey sweet plate of wonderful. The grilled cauliflower had a crispy lightness that, when combined with the avocado from the guacamole, blended to give a mouthfeel so close to fatty bacon that I wish everyone who says “mmm bacon” could try this and understand why vegans don’t care about your stupid bacon anymore. This, right here, was the star of the evening. I could have eaten two more full plates of this without blinking an eye. While we waited for our entrees, we had a chance to speak with Michael, the manager, who is very enthusiastic about the experience Mercado is presenting to its patrons. Of great importance to the chef is how to utilize all those wonderful veggies from the Farmers’ Market. One thing I took away from conversations with Jesse, Michael and our server Victor, is that everyone is very proud of the operation they have, everyone knows their place and their role in keeping this well-oiled machine running. Everyone who had anything to do with our table, including servers passing by who took away empty plates and glasses, all seem to love their work and it shows in the product. And then our entrees arrived. My enchiladas were so pretty, I have never seen enchiladas covered in yellow mole! It was clear from the flavor that it was made with some sort of squash, butternut perhaps?, but it was more complicated than just a squash mole. Asking Michael on one of his passby‘s, we were told that the sauce was made with “roasted yellow vegetables” and I have much appreciation for the secrecy over an original recipe. Very original! 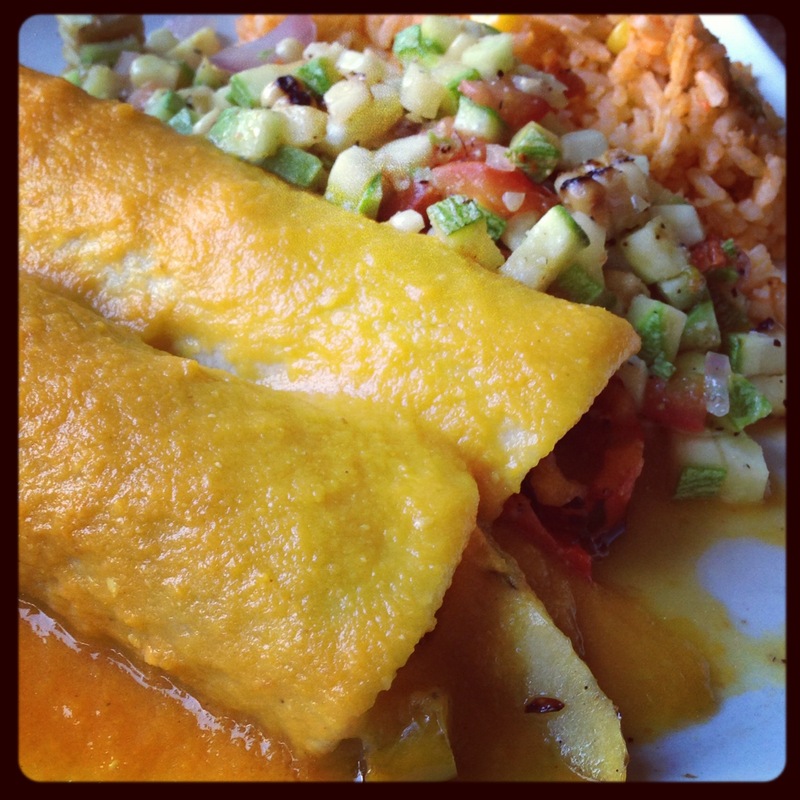 It proved almost impossible to take a photo of the veggies inside these enchiladas. Not because it wasn’t aesthetically pleasing, but because I couldn’t stop eating long enough to take photos! I’ve learned that it’s imperative to snap pictures before I begin because once the food hits my mouth, I forget that I’m supposed to do anything but enjoy. And there was so much to enjoy inside these enchiladas that each time I thought I had the ingredients pegged, something new would reveal itself. Best I could tell, there were zucchini, yellow squash, red pepper, carrot, purple cauliflower, mushrooms, yellow pepper and onion, and because they were grilled, the flavors were deep enough to stand up to that yellow mole so that both existed together in a little enchilada paradise. Hey, do you notice what’s been served as the two sides on my plate? That’s the same calabacitas and red Mexican rice from Yxta! It was almost like having two meals in one. I was just so happy to get another serving of the Mexican rice! 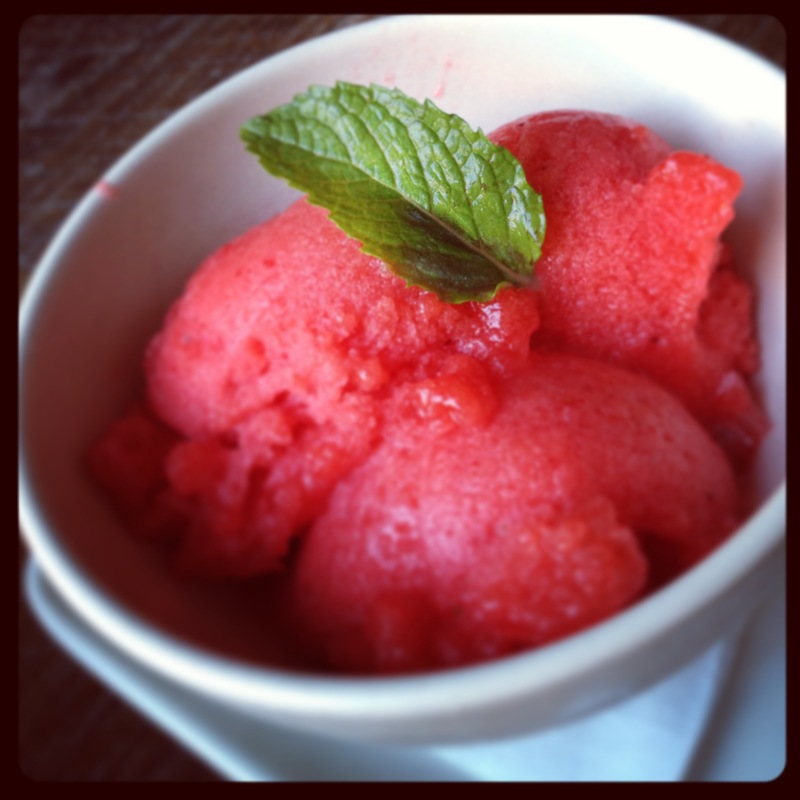 Who has two thumbs and was served a luscious strawberry sorbet for dessert? This gal! I had a difficult time getting a photo that truly represented the redness of this sorbet. It tasted exactly as strawberry as it looks, and the inclusion of some seeds added a much appreciated textural touch! It was a huge serving to boot, and my only regret is that I actually couldn’t finish. 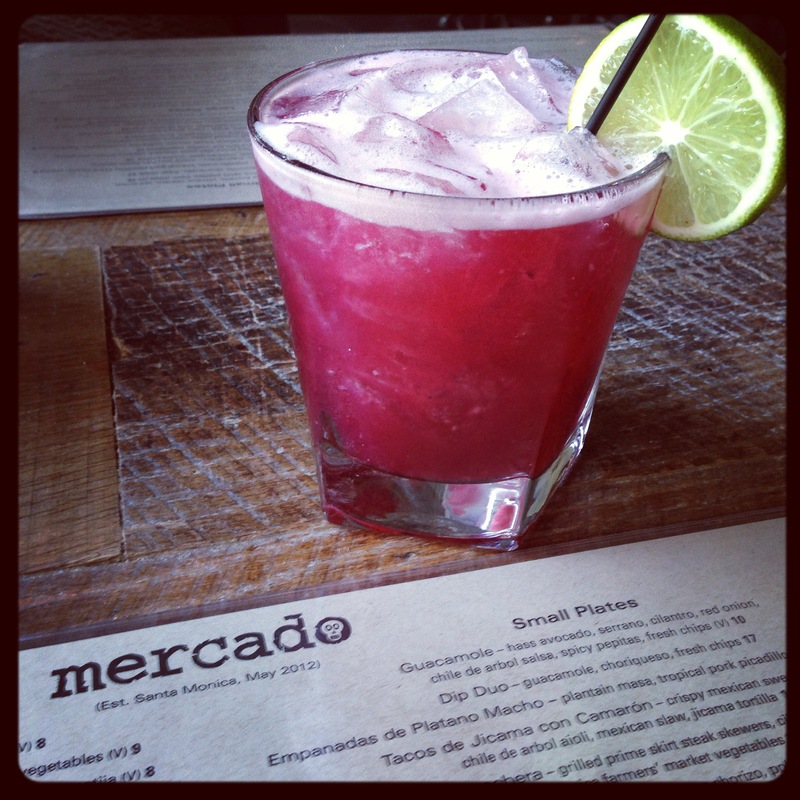 Mercado was a really fun dining experience! The space is set up in such a way that it makes it feel like a gathering of friends or coworkers. 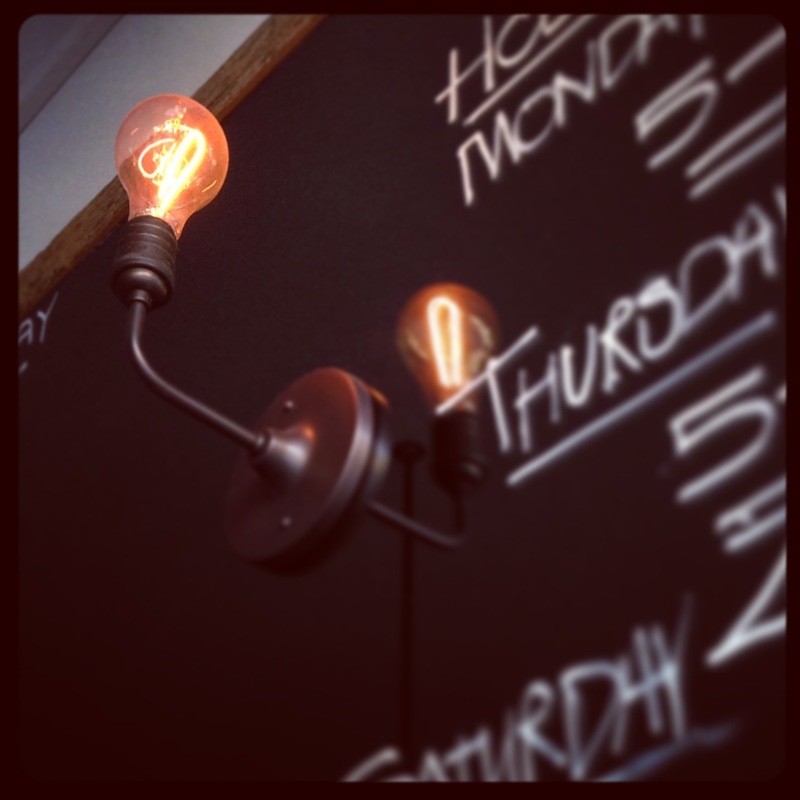 The decor is fun, I especially loved the blackboards on the walls and the whimsical fixtures. It’s not all that difficult to find on 4th street (it’s across from the Pottery Barn) and there are several public parking structures nearby. We only walked a block and a half, and walking in Santa Monica is always fun! 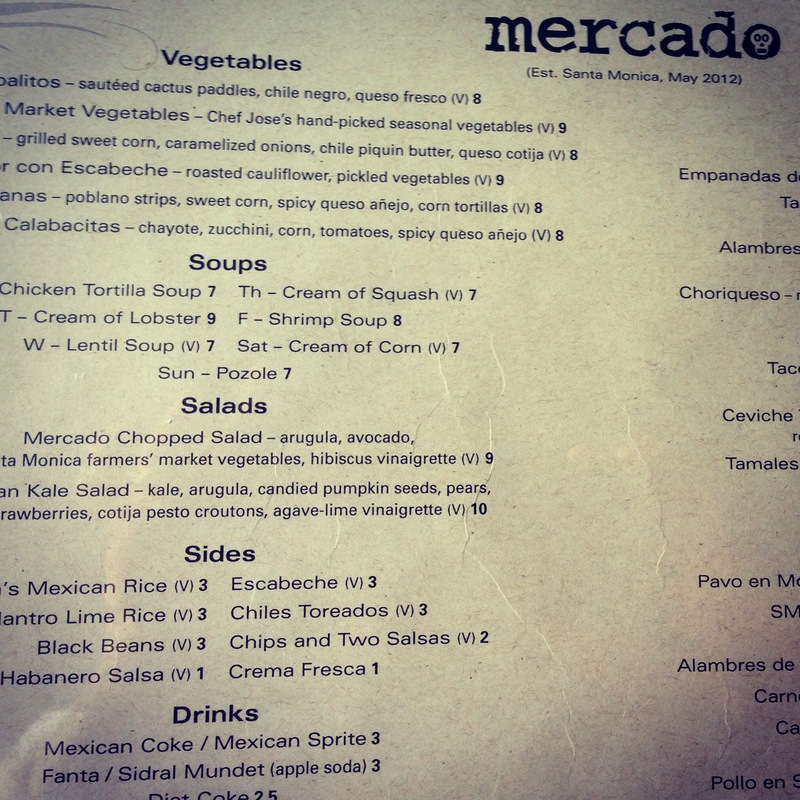 Mercado earns itself 5 Sprouts for its very vegetarian friendly menu. There are several vegetarian meals already on the menu, and with such a helpful and knowledgeable staff, you don’t need to feel anxious to ask questions about turning one of them vegan. Don’t forget to check out Friand’s (non-vegan perspective) review on Yelp! Because sometimes we vegans like to take our omnivorous family and friends out for a great night, too!